Because I’m not as strong as I pretend to be. When I am weak, it’s you I seek and you’ve always defended me. The devil and his fire will not defeat me. Keep me safe from hurt harm or danger and be my hedge of protection. I know that your love gives favor, an edge, and direction. Thousands of miles I’ve driven and a million tears cried. As I wipe my face, by your grace, all fears die. I ask that you make me dependable and take me to pinnacles. 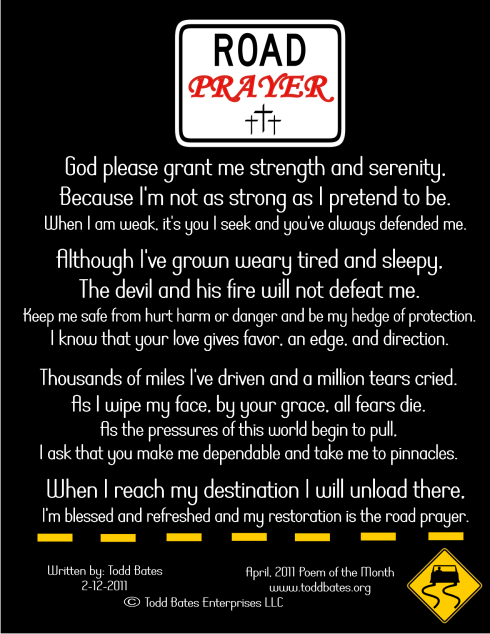 I’m blessed and refreshed and my restoration is the road prayer. Thank God for you and your family.May God continue to bless you.Trey,Terrance,Jaylon,Carlos,Jermeal and Malik end their love and best wishes.God bless you.